Chicagoans is a first-person account from off the beaten track, as told to Anne Ford. 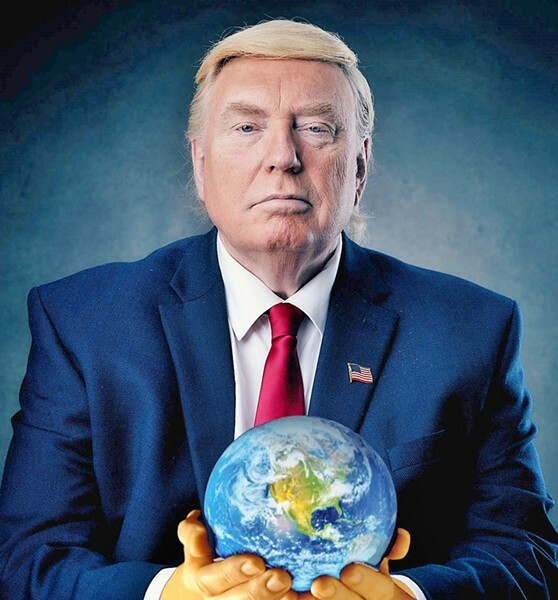 This week's Chicagoan is Dennis Alan, 67, the Ultimate Donald Trump Lookalike. "Mine is not to reason why, right?," says Dennis Alan. By nature's curse or benefit or whatever, I just happen to look like Donald Trump. It takes me five, ten minutes to make myself up. Most of the other impersonators who do Trump need some kind of facial prosthetic, but I can just throw on some foundation. And I'm as fat as Trump is, so I don't need any assistance there either. If I have to apply the hairpiece, that can take maybe 20 minutes. I've done advertisements in South Korea and Hong Kong, and I did an advertisement for Twinkies in Cairo. It was a video with an Egyptian film star for some new flavors of Twinkies that were coming out. Trump has a signature orange tone to his skin, and evidently one of the new flavors was orange. It's going to sound crazy, and I felt crazy, but in the ad I was in a tiki bar next to this movie star, a big hulky guy, and he was juggling oranges and I was pouring orange juice into a stein and sipping on it and watching him juggle. Mine is not to reason why, right? People approach me to do parties and things, but in smaller venues, particularly where alcohol is going to be served, I don't know if I'm walking into a crowd of people that want to throw things at me or what. I have had offers to be in a dunk tank or have a pie thrown at my face, and I'm just not going to do that. And I get offers to take part in rallies and things like that, and I don't do those either. One of the reasons is security. There have been a couple of incidents where I was wearing the baseball cap that says MAKE AMERICA GREAT AGAIN and people actually attacked the hat. Impersonating Trump has changed my life in that among people who knew me before this, I have become kind of a celebrity. It's kind of the thing where if you are overweight and then you become thin, your relationships with all the people in your life will change. Up to that time, you were the fat person in their life. Whereas before this happened with Trump, I was just a schmo. As a matter of fact, when I go out and socialize now, I avoid making it known that I do this. Maybe somebody who has craved this sort of thing their whole life would bask in the attention, but I don't feel that way about it. Worse than that is that people assume that because I look like Donald Trump, I behave like he does. People treat me as if I'm going to treat them like their image of Donald Trump would treat them. But I forgive them for it, as long as they don't come up and hit me. I say in humor, "I'm gonna do this till he gets shot or impeached." Sooner or later, it's gonna end. I'm reminded of the movie Patton, where he was saying that in ancient times, a victorious general would be returning from battle, and he'd have a victory parade in a chariot, and somebody in back of him would be whispering in his ear, "All glory is fleeting." So I'm hearing that in my ear even now. Dennis Alan is on Facebook at The Ultimate Donald Trump Lookalike - Dennis Alan.